FREE Living Trust Identification Cards. These wallet-sized laminated cards with our office address and phone number on one side, and the name and date of your Trust on the other will serve as a handy, on-the-spot reference whenever you buy new investments, open a new account or conduct a transaction for your Trust. FREE circumscribed telephone support. We encourage our estate planning clients to call us with questions, as most of those questions can be handled at no cost to the client. Whether you need specific help with your own Trust or just want information on other estate planning strategies, give our helpful staff a call. Please note, from time to time, more involved and long questions do mandate a fee, but most can be handled at no charge. FREE subscription to our periodic newsletter, Your Estate Matters, where you’ll learn about estate planning topics and other informative subjects relevant to you and your family’s needs. FREE Client Seminars. We periodically offer seminars and presentations exclusively for our clients on various estate planning topics. FREE eAlerts with news and announcements delivered periodically for our friends and clients with email addresses. FREE DocuBank subscription for 1 year. 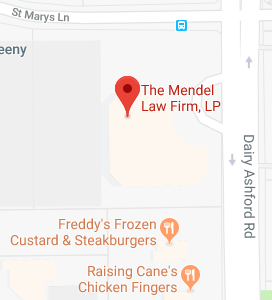 The Mendel Law Firm, L.P.